Well, my hidden talent is that … no, I can’t say … but I must, so here goes … despite my rather spindly physique, I am able to smash out 200 push-ups (not totally in a row, but I get there)!!! This is a tricky one, as villains in movies are the ones that always pop into my head, so I have ended up with a couple that are both in books (or comics) and movies … The Warden from Shawshank Redemption, and The Joker from the Batman comics. Stephen King, because I have seen him talk and read his books, both fiction and On Writing, and he would just be amazing to be around. Andy Griffiths, because he’s a funny funny man. Harpo Marx - I don’t know if this counts as literary, but he has written my favourite book of all time (Harpo Speaks), and he did spend all his social time with the great literary folk of his era, and he had an amazing attitude towards life. I would also invite Dr Seuss, because he is just the gold standard legend of children’s books in my mind. And finally, I would invite J.K. Rowling so that I can steal her credit cards. The Wishstones from the Wishstones of Shannara. They unite heart, mind and body to create awesome power. They guide you when you’re lost. And they’re pretty and blue! Planning? Never heard of it. Funny, entertaining, inspiring, funny, awesome. Okay, well, as fate would have it the nearest (and only) book on my desk is Accidentally Awesome!!! So the second word in the first sentence on Page 22 is … drum roll please … BLOOD! Blood dripped from the open wound below his eye, and he grinned. This was going to be fun. I would ask Andy Griffiths if The Day my Bum went Psycho was based on a real-life experience. AAAGGGGHHHHH! AAAAAGGGHHHHHHH! AAAAAGGGHHHHHHH!!! You said quirky questions, not evil mind-bending no possible answer questions! No. Sorry. I refuse to answer on the grounds that I can’t think of an answer. 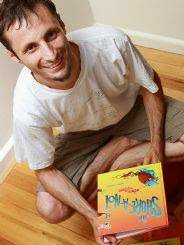 Adam Wallace is an Australian author whose works include picture books, junior and middle fiction, and non-fiction books on cartooning. 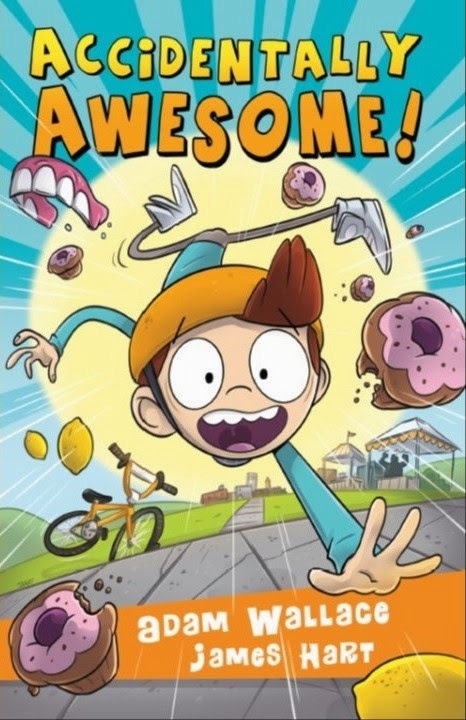 His latest book, Accidentally Awesome!, is a junior fiction novel released in March 2015. Visit Adam's website and Facebook page for more information about his books and author events.